Set up in only April 2010, The Windsor & Eton Brewery is already making a fantastic name for itself. After nearly 80 years without a local brewery, a group of friends decided to quit their respective jobs and combine to create The Windsor & Eton Brewery with two simple aims, to create great traditional cask ales and of course, have fun! I visited the Brewery back in January and to say I was impressed by their beer was an understatement. Although very small relative to most other breweries in the UK, they have a fabulous range of top quality beers and even do guided, informative and extremely boozy personal tours (with which I was only too happy to join in). Their beers have won a plethora of awards over the past three years, but there are three in particular I will be focusing on: The Guardsman, The Conqueror & The Windsor Knot. Their first ever beer (and therefore the first new ale to be brewed in Windsor in 80 years), The Guardsman is a traditional, classic Best Bitter. Brewed with a combination of premium maris otter malt with fuggles and goldings hops, this beer produces a beautifully floral, tangy and hoppy taste with lovely balance and a fruity finish. One of the top Best Bitters I have ever tried and delicious both on tap and in bottle. This brew claimed the Beer of the Festival at the Runneymede Beer Festival in 2012 as well as the Royal Windsor Racecourse Real Ale Festival in the same year. AND, just to keep up with tradition, they even change the colour of the plume on the bottle whenever the Windsor Royal Guards do depending on which regiment is in residence. Dedication. 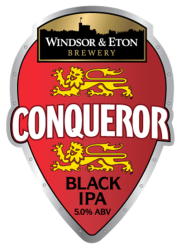 Named after William the Conqueror who ordered the building of Windsor Castle back in 1075, this is a rich, dark, hoppy IPA. That's right, this is a DARK IPA! Made in the traditional IPA style to be strong, dry and hoppy (in order to withstand the passage to India), the darkness comes from the blending of 5 distinct malts including Chocolate and Smoked. What you're left with is something that is rich and chocolaty like a good stout but you also get the full taste of the hops just like an IPA, a fantastic drinking experience. Winner of the London & South East category at the CAMRA Beer of Britain Awards. 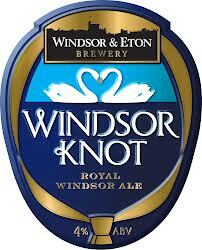 Made specifically for the Marriage of HRH Prince William & Kate Middleton, The Windsor Knot is a pale ale produced from a blend of two hops native of New Zealand, the Sovereign and the Nelson Sauvin. This immensely easy drinking pale ale is abundant in tropical fruits giving it a lovely bitter/sweet tang. Originally only limited edition, due to popular demand this refreshing, gently carbonated ale is now a permanent fixture in their range and one that really needs to be tried if you enjoy lighter beer. Also, after the birth of the royal baby, they even made 300 limited edition bottles named The Windsor Cot - I know, n'awwwwwww. These three are only a small portion of their range, all of which are absolutely stunning and each have their own special character, flavour and stunnning bottle design. They are available for order from the website and are regularly available at pubs in and around Windsor & Eton. So if you see one available (most likely to be The Guardsman) I implore you to jump right in. And if you're ever in the area, you must stop in and do the tour, as they really are a smashing bunch of guys with a very, very bright future in brewing.